Picturesque hikes, mind-blowing views, and friendly locals are just a few of the reasons we fell instantly in love with Muang Ngoi Neua (usually referred to just as “Muang Ngoi”). A tiny village only reachable by boat, Muang Ngoi is the kind of place I dream of when I dream of travel. It is one of the most beautiful places to visit in Laos. The quiet there is so intense that at night you fall asleep to the chorus of frogs mixed with the lapping of the glorious Nam Ou River against the shore. The wi-fi is nearly unusable, and there is nothing much to do in this sleepy town besides exploring the stunning nature that stretches for miles in every direction (or lounging in a hammock admiring the views). Today I’m sharing a complete guide to visiting Muang Ngoi Neua Laos. Most visitors to Muang Ngoi will arrive from the town of Nong Khiaw, which is south of Muang Ngoi on the banks of the Nam Ou River. 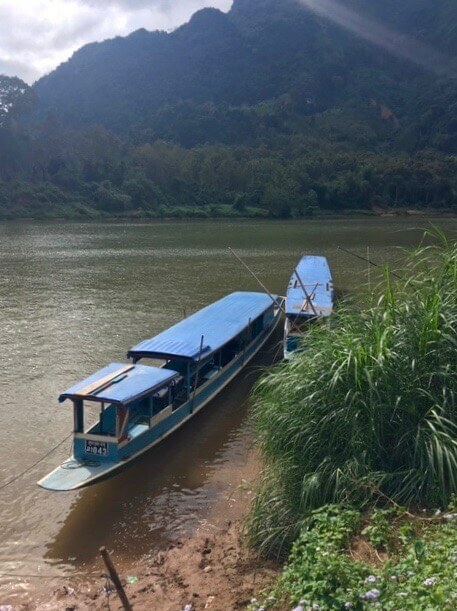 To get from Nong Khiaw to Muang Ngoi you will need to take a boat ride upriver as there is no road to Muang Ngoi at this time. The boat ride takes about 90 minutes, and floats by huge stretches of wild jungle, as well as a couple of tiny villages. The Nam Ou River is wide and powerful, and the boat ride can certainly get exciting in certain spots. There are two options for travelers wishing to visit Muang Ngoi from Nong Khiaw- public boat or private boat. The public boat leaves at 10:30am and 1:30pm from Nong Khiaw every day. Tickets for the public boat cost 25,000kip (about $3 USD). Keep in mind that these boats are small, and the boat captain will squeeze in as many bodies as possible for the ride to Muang Ngoi. We had a particularly poor experience on the public boat, as our boat was severely overloaded and literally began to sink on our way to Muang Ngoi (there will be a future blog post dedicated to this hilariously bad boat ride). Private boats can be hired for the journey if you prefer a bit more comfort. When we asked about private boats we were quoted 200,000kip ($23 USD) total for a small boat (basically a skinny canoe with a motor), and 400,000kip ($46 USD) total for a large boat (these are the same size as the public boats). While the private boats are quite a bit more expensive than the public boat you could make them affordable by getting a group together to hire one. The small boats can hold 4 passengers, and the large boats can easily hold 6-8 passengers comfortably. Whether you want a public or a private boat you will need to stop at the local boat dock in Nong Khiaw to get your tickets. Known as the Nong Khiaw Pier, the dock is located on the north side of the large Nong Khiaw bridge, near the Coco Home Bar and Restaurant. If you happen to be making the boat journey from the northern village of Muang Khua to Luang Prabang you can easily make a stop at Muang Ngoi as it is right along the way! Just like most of Laos, Muang Ngoi experiences a rainy season from April to October. During the rainy season the Nam Ou River becomes much more powerful, and it is much more difficult to visit the village. The dry season for Laos runs from November to March. We visited in January, and while it did rain once, the weather was mostly sunny and warm. The dry season is also the most popular time to visit Muang Ngoi, but even in January the village felt very sleepy and quiet. There are plenty of accommodation options in Muang Ngoi for most budgets, though we didn’t see any dormitory-style hostels, and there also were not any ultra-luxury accommodations. However, there were many options for budget travelers, and there is one fancy guesthouse option for those looking for a bit more comfort and luxury. This was the guesthouse we stayed in, and we loved it so much we stayed a full week in our bungalow. Nicksa’s is run by a friendly Lao couple who are happy to help you with any questions you may have. Our bungalow offered an unobstructed, panoramic view of the Nam Ou River and the surrounding limestone cliffs. To compliment this view, there were two hammocks on the balcony, as well as a bench and table. Inside the bungalow was very simple- a double bed with a decent mattress and a mosquito net (we never needed it on our visit in the dry season thanks to the screens on the bungalow windows). An attached bathroom featured a hot shower and western style flushing toilet. Nicksa’s also has a riverfront restaurant featuring mostly breakfast and lunch options. There is wi-fi in the restaurant, but it is almost unusably slow (as is all of the wi-fi we encountered in Muang Ngoi). There are three levels of bungalow options at Nicksa’s. They all have river views and hammocks, but some are smaller with bucket flush toilets. Our bungalow was 70,000kip/night ($8 USD). Next door to Nicksa’s, this guesthouse is run by a lovely couple who we ran into a few times around town. The rooms here are more modern than Nicksa’s, and also have a nice river view. This is the only place in town where you can rent bicycles, though there are only a few available. I would imagine that their own guests would get first dibs on the bicycles so that may be a a perk for staying here as well. Bungalows here run $15-$18/night according to online booking sites. What really stands out about this guesthouse is the beautiful grounds. Although the bungalows here do not have a river view, they are situated around a beautifully kept grassy garden area that feels very relaxing. The bungalows look new and clean. They cost $20/night according to online booking sites. This is definitely the fanciest hotel in town. The river view bungalows here are up on the second floor above the restaurant, which allows for a beautiful view and a bit more privacy than other bungalows in town. Each river view bungalow features modern furnishings and a sliding glass door out to a big river view balcony. There are also some cheaper bungalows on the grounds that don’t offer the impressive riverfront view. River view bungalows are $58/night while the cheaper bungalows are $29/night. Breakfast is included in the price. Should you book Muang Ngoi accommodation in advance? We were traveling in high season and there were plenty of rooms available all over town. I don’t think it’s necessary to book your room in advance. However, if you prefer to avoid the hassle of finding a room when you arrive several guesthouses in town do offer online booking. For such a tiny village, Muang Ngoi has a LOT of restaurant options! Keep in mind that the service is very slow at all of the restaurants. In most cases there are just one or two people waiting tables, bartending, and cooking. Don’t wait until you’re starving to sit down for dinner or you will get grouchy waiting for your order. PRO TIP: Be sure to order fried river weed (shown in the picture above). The name may not sound very appetizing, but it’s delicious. Seaweed from the river is pressed with garlic and sesame seeds, sundried, and then fried to a crispy perfection! We ate here a few times, and every time the food was delicious. In fact, this place served the best vegetable pakora we’ve ever eaten! Chicken dishes seemed to be his specialty, but there are plenty of vegetarian options on the menu as well. Food all over Muang Ngoi is very affordable, and this restaurant is no different. We ordered rice, naan, appetizers, and main entrees and our bill only came out to around 70,000kip! Deen’s is about halfway down the village main street and is well marked, you won’t miss it. As far as food, Gecko’s offers a wide range of western and Lao dishes. The breakfast here is especially good as they make a solid cappuccino, and have fresh baguettes available. Gecko’s is located on the south end of the village, and has a prominent sign on the main street. This is the perfect place to sip Laobeer, read a book, and watch the boats go by along the river. We spent a few afternoons snacking on river weed (our favorite Laotian snack!) and relaxing in the big futon-style seats. The food here is also very good, especially the western options! The burgers are pretty darn close to what you get in the states, and the french fries are hand cut. Riverside Restaurant is located on the river on the northern end of town. Watch for the big sign on the main street, which will point the way. Muang Ngoi is surrounded by hiking trails, caves, rivers, and is an ideal spot for nature lovers. Before you set out exploring the surrounding areas it’s important to understand the history of this village and the country of Laos. Many people are not aware that from 1964 to 1973 the United States dropped over 270 million cluster bombs on the country of Laos. This was part of the campaign referred to as “The Secret War” in U.S CIA documents. About one third of these bombs did not explode, which means that Laos was left with 80 million unexploded bombs littering the country. Since 1974 they have only been able to clear 1% of these unexploded bombs from the Laos wilderness, and Laotians are still killed every year by these bombs. You will see the marks of this tragedy all over Muang Ngoi as the villagers have re-purposed bomb casings to be used as flower pots, water troughs, and many other things. During the bombings the villagers of Muang Ngoi lived in the caves around town to stay safe from all the bombs. When you go hiking in Laos it is essential that you stay on the trails and follow marked routes. On the northern end of the village you will see signs for the hike to the viewpoint and Pha Noi cave. The easiest way to find the trail is to walk directly through the wat at the northern end of town. At the back of the wat there is a gate you will pass through and just outside the gate is the trailhead. Follow the trail a short distance through the forest and you will reach a small house where you pay 10,000kip to continue up the trail to the viewpoint. It’s a steep hike to the viewpoint but there are bamboo handrails and it is akin to climbing a very long, steep flight of stairs. PRO TIP: There are also two caves along this trail, so be sure to explore those on your way to or from the viewpoint! On your way to the viewpoint you will reach a fork where a sign points to a cave to your right, and another further up the trail (the one up the trail is the larger Pha Noi Cave). Head off to the right first, as this cave is the smaller of the two and will not take as long to explore. The first cave is quite small, and you do have to crawl a bit to get deeper into it. It doesn’t go back very far, however, and the crawl spaces got too small for comfort so we only briefly explored this cave. Return to the main trail and continue up to the main cave- Pha Noi Cave. This cave doesn’t look like much at the entrance but once inside it is cavernous, and you can easily hike deep into the depths of this cave. At one point you will need to climb up a ladder, and then down another ladder to reach the back of this cave where there are tiny Buddha shrines that have clearly been there for many, many years. As you walk deeper into the cave you will start to wonder if you’ve gone too far, but there is no missing the Buddhas when you reach them. Be sure that you have a flashlight with you, and I would recommend at least one back up source of light! Once you’ve gone about 20 feet into the cave there will be absolutely no outside light due to the way the cavern twists and turns away from the entrance. You do NOT want to find yourself without a light source when you are deep in this cave. 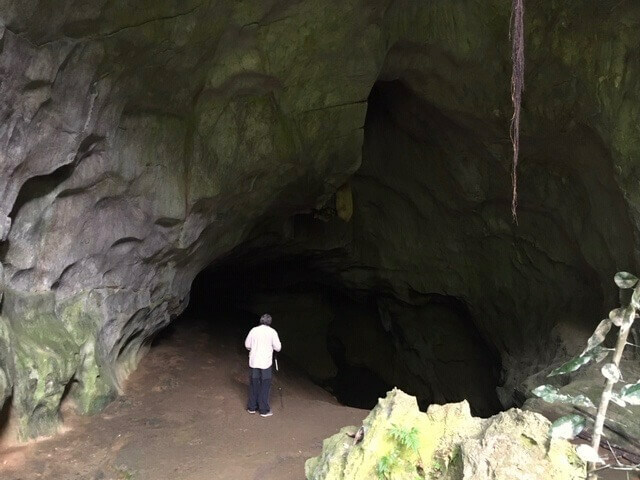 This cave, located south of the village, is much more cavernous than Pha Noi Cave. To enter this cave you must also pay 10,000kip. You will need a flashlight for this cave as well, as it gets very dark if you decide to hike into it. Since a stream flows into this cave it is extremely hot and humid. It is also pretty slippery so be very careful if you decide to climb around inside. Outside the cave a small stream feeds a lovely, crystal clear pool full of fish, and the man managing the entrance said it was okay to swim in this pool if we’d like. We didn’t have suits with us but we did wade a bit and enjoyed watching the fish swim around us. To get to Tham Kang Cave walk towards the southern end of town and take a left just before Gecko’s restaurant. Walk down past the school on your left. You will reach a T-intersection where you should turn right onto the dirt road. Follow this dirt road until you reach Tham Kang Cave. If you continue to hike about 45 minutes past Tham Kang Cave you will reach the idyllic Ba Na village. At the end of the village there is a tiny restaurant where we had a nice Laotian lunch and took a break after the long hike to the village. Ba Na gives you a real idea of what life is like in the Laos countryside. Villagers walked their water buffalo down the dirt road, wove beautiful scarves on looms, and cooked over small charcoal pits outside their homes. The people were warm and welcoming, and we were very glad we made the long hike to visit. It is possible to stay a night in Ba Na, as there were a couple homes offering rooms for the evening. There are loads of tours available through the guesthouses around town. These include everything from multi-day jungle treks to kayak trips down the river, and trek/homestay combinations at the surrounding villages. If you have something in mind that interests you just ask around and there will likely be a guide who can arrange it for you! The view from our bungalow’s hammock was absolutely incredible, and swinging in the hammock became an activity all in itself! From the bungalow balcony we watched water buffalos swim and play. We listened to birds chirping, and watched them dive into the river. Every evening we watched the light change dramatically across the jungled hills as the sun set behind the mountains. 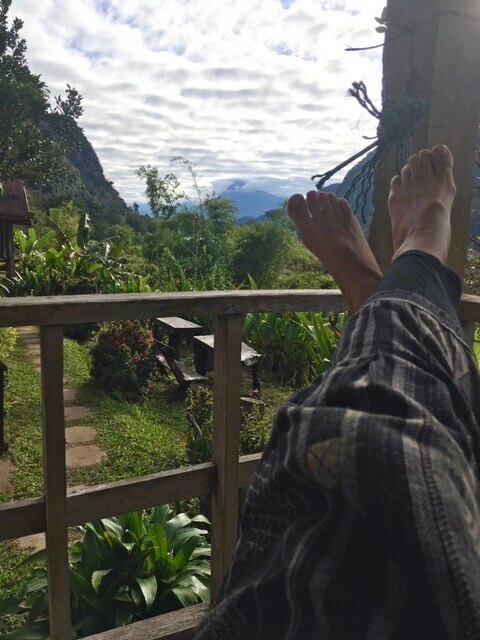 I actually think that hammock lounging is one of the very best activities in Muang Ngoi! Just like in Nong Khiaw, you can easily hire a private boat in town to take you up or down river. Check with the restaurant right next to the boat pier for more information. About halfway down the main street there is a seamstress who can fit you for a new Laotian outfit or do repairs/alterations on your clothing or backpacks. Tom had a pair of shorts repaired here and she did an excellent job for a very fair price. If you have any clothes, bags, or shoes that need repair definitely stop in here! Nearly ever guesthouse in town will do laundry for you. The rate everywhere is 10,000kip ($1.15 USD) per kilogram. If you want in back in a hurry be sure to ask if they can machine dry it for you, otherwise air drying will take a while in the high humidity. There are a couple spots in town that have signs up offering massage services. We never saw much activity going on around these businesses so we never stopped to try them out. If you’ve had a massage in Muang Ngoi leave a comment on this post and let us know how it was! There are a few guesthouses and restaurants near the boat pier that offer money exchange of US dollars or Thai baht. The rates are not very good so it’s really best to arrive with as much Laotian cash as you’ll need. There is no ATM in Muang Ngoi. However, Ning Ning Resort can run your debit card and give you cash if you’re in a pinch. They charge 5% for this service, which is a very reasonable fee considering the only other way to get cash is to take the boat all the way back to Nong Khiaw! 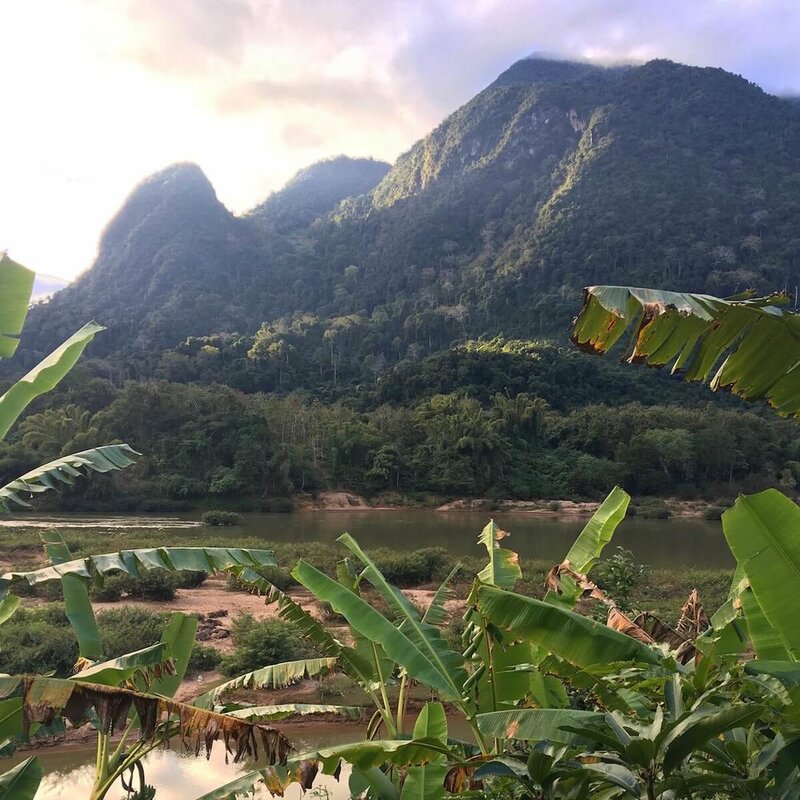 We absolutely loved our visit to Muang Ngoi, and found it the perfect spot to slow down and really enjoy the nature of Laos. The surrounding scenery felt a lot like Yosemite National Park in the U.S. if the cliffs in Yosemite were covered in jungle foliage. However, keep in mind that Muang Ngoi is just a tiny village, so it may not be ideal if you are looking for entertainment or nightlife. It’s particularly important to note that the whole town seems to be shut down by 8 or 9pm. There are no bars and no nightlife, aside from the cocktail happy hours at some of the restaurants. 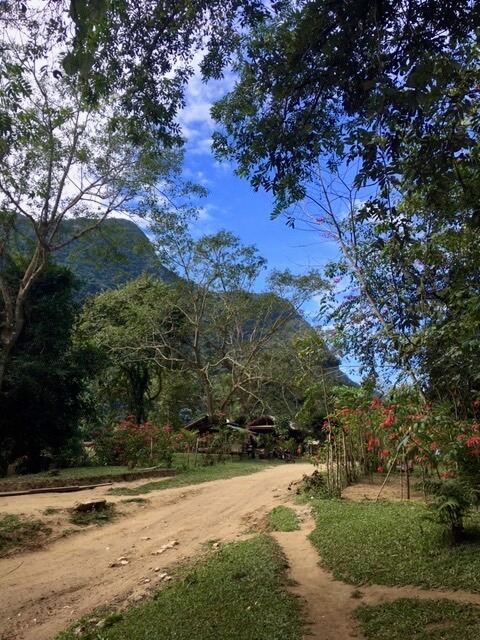 The sleepy, slow nature of this village was a huge part of why we enjoyed it so much, and if you want to get a taste of authentic Laotian culture you must add Muang Ngoi Neua to your Laos itinerary! Are you planning your own Southeast Asia adventure? Check out these top Southeast Asia destinations chosen by top travel bloggers! Read about how we travel for 6 months with just carry on backpacks! Check out our Southeast Asia backpacking route- we’re updating it as we go!